New power sanders are hitting the market all the time. Many of the more recent innovations are in the detail sander area. 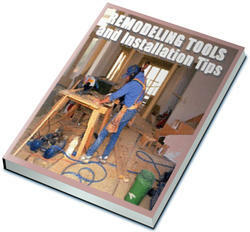 These compact tools have triangular sanding pads that let them fit into areas that otherwise could only be hand-sanded. IFile down any traces of the old burrs on all edges of the cabinet scraper, using a fine singie-cut metal file. Don't get too aggressive with the ftle—It doesn't take much power to remove a fine burr. 2 With the cabinet scraper held firmly in a vertical position, fiie the edges fiat at an exact 90° angle, using the metai fiie. Take care not to overwork the edge. 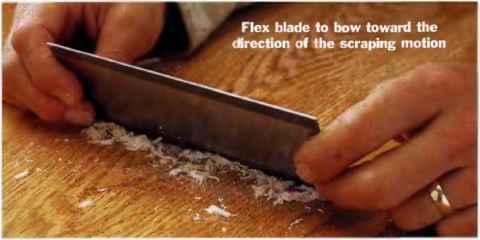 TO USE A CABINET SCRAPER, hoid the ends and press in with your thumbs to cause a slight fiex. Hoid the scraper at a fairly steep angle and push it away from yourself, applying downward pressure as you push (you can also flex the scraper inward and draw it toward yourself).